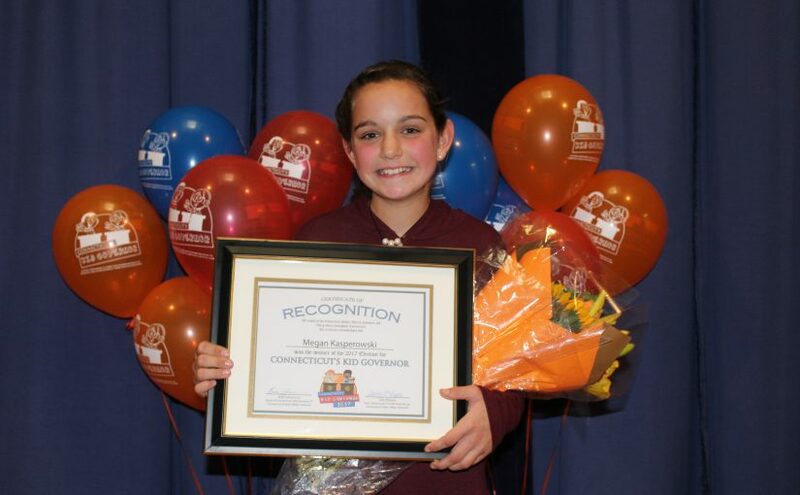 Portland, CT— On Tuesday, November 21, 2017, the Connecticut Public Affairs Network announced that fifth graders across the state had elected Megan Kasperowski of Portland as the 2018 Connecticut’s Kid Governor® (CTKG). The announcement came during a school-wide assembly at Brownstone Intermediate School where Megan is a fifth-grade student in Mr. Santavenere’s class. A breaking news segment featuring anchor Mark Zinni and Deputy Secretary of the State Scott Bates shared the election results with Brownstone Students and online viewers across the state. Classmates cheered and the Portland High School marching band played as Kid Governor-Elect Megan, who ran on a cancer awareness platform, thanked voters and fellow students for their help and support. You can watch Megan’s campaign video here. You can watch video of Tuesday morning’s announcement here. More than 6,100 Connecticut fifth graders registered to vote in this year’s Statewide Election as students across the state were nominated by their classes to run for Connecticut’s Kid Governor. The award-winning statewide civics program, which is in its third year, was created by the Connecticut Public Affairs Network (CPAN) in order to teach students about elections, the importance of civic engagement and contributing to their communities. Candidates were required to submit a campaign video about a community issue important to them as well as a three-point plan designed to help other students take action on the issue. Seven final candidates moved on to the week-long election and their videos were posted to the CTKG webpage, CT.KidGovernor.org, for their peers to watch before casting their ballots. The 2017 CTKG final candidates’ videos are still available for public viewing here. Megan will begin her term as the 2018 Connecticut’s Kid Governor following her inauguration at Connecticut’s Old State House in early 2018. She will take part in CPAN public programs, raise awareness to help those fighting cancer, and encourage students across the state to take action on her platform. Megan will take over for the second and current Connecticut’s Kid Governor, Jessica Brocksom of Milford, who won in the 2016 CTKG Statewide Election on her platform of promoting the humane treatment of animals. 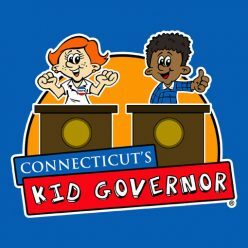 You can learn more about Connecticut’s Kid Governor– both the program and the student– at CT.KidGovernor.org or by following CTKG on Facebook, Twitter, and Instagram. “Breaking News” segment featuring Mark Zinni and Deputy Secretary of the State Scott Bates. Recording of the announcement assembly at Brownstone Intermediate School.